Since I was a young kid, I always heard the same comment on my shin: “哇！你的脚很‘亮’叻！”(Wow! You legs are so ‘shiny’), or “你的脚很干，记得搽润护霜·”(Your skin is very dry leh, must remember to apply moisture). In fact, during my late primary/early secondary school, my all-time habit is peeling off the dry flaky skin from my toes and soles while watching TV. Somehow over the years, my skin condition improved, and I assume it’s because my improved person hygiene and begin to take my decently conditioned skin for granted. Around May 2016, not sure if it is due to work stress, or hormone change after delivery, I realised my childhood “friend” are back to visit me. Initially it started off with my lips getting dry, and then it began to crack, and then bleed. Thinking is was caused by lack of water during my OT days (I have the bad habit of stucking in my chair, not drinking water nor going toilet when I was real busy), I just ignored my dry lips and hope it will go off. But even after some reshuffle of work arrangement, no matter how much water I tried to drink, my lips still bleed like nobody business, that is when I begin to realise the seriousness of the problem. Consulted a few doctors, and their medicine is only good if I apply them daily. Skipped a day and my dry lips will begin to crack. After a while, even my eyelids also become so dry that Kpo Kia papa feel it quite disturbing. Finally I decided to bite the bullet and went to consult a specialist in September, and the condition improved. In a month time, even after few days/a week of not applying the medicine given, my lips will only get dry, but not crack. Just when I thought nothing can be worst, I noticed my hair have more dandruff than usual, in fact, my scalp started to become so itchy, I can’t stopped scratching it (again!). Not too long after, I noticed the skin on my scalp turned dry and inflamed skin … nether less to say, it’s another form of eczema…. 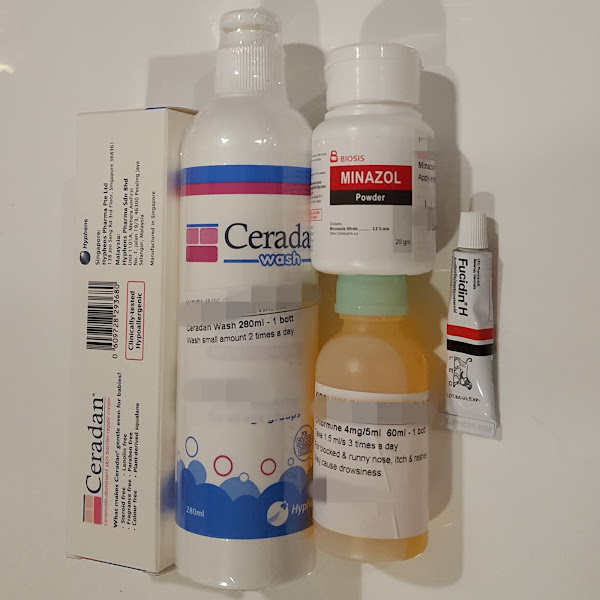 So from year 2016-2017, I have welcomed back my old friend, eczema, and this time, they come in as a happy family – Oral (Perioral Dermatitis), Ear (Chronic Otitis Externa), and Scalp ezcema are here to find me… hope I have a way to fix all of them and is able to share with you in near future! Unfortunately, Kpo Kia have a mother who is suffering from “almost severe” eczeme, and a daddy who have sensitive nose all the time, Kpo kia has been diagnosed with Eczema on her forehead when she is around 9 months old, and recently over her whole body. Round 1 when she is around 9 months old: When she got her first eczema attacked on her forehead, it happened that she had a fall and knocked on her forehead the day before, initially we thought it’s just a fall mark that will goes off, but realised her skin been getting so red and dry and begins to looks a bit flaky. To be safe, we brought her to see a PD. 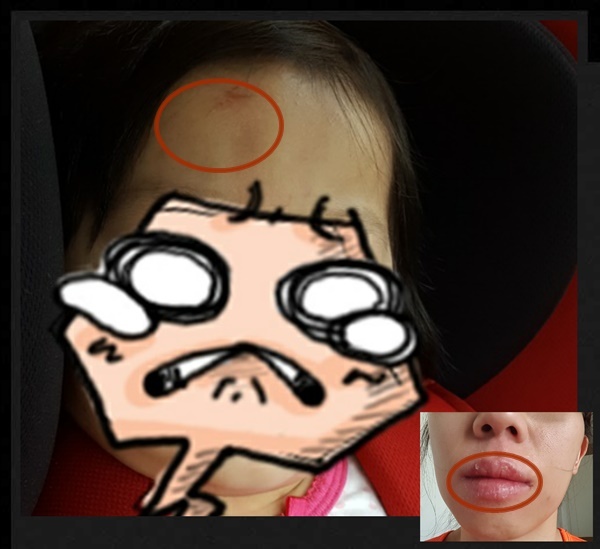 PD confirmed it’s eczema attack and gave us some medication to apply, after a month or two, her forehead is “back to normal” – no more red and inflamed looks-alike skin, just a bit dry. 2 months have passed and she is now much better, no more red, inflamed skin except a small patch of her back where the diaper tape is situated, and unavoidable dry skin all over her body. We were initially lazy parents who sometimes do not bother to shower her at night during weekend if we are home too late, or when we are too tired (just wipe her with wet towel), but now we always make sure she have her 2nd (or even 3rd) bath of the day no matter how late it is. We also diligently apply aloe vera lotion / moisturizer after every shower/wipe, and at times when she wake up in between her night sleep. Medically, Eczema is also known as dermatitis, it is a type of chronic skin condition which varies from person to person and can comes in many different forms. Eczema can affects people of all ages but is primarily seen in children. Even those who “outgrown” their eczema condition during early childhood may see it recur again in later life (e.g. Me!). Atopic dermatitis is the most common type of eczema, and has been called the “itch that rashes.” The general term “eczema” is usually used to refer to Atopic dermatitis. “Atopic” means an allergy that is usually hereditary, and “dermatitis” is defined as inflammation of the skin. In mild or moderate cases, the skin is dry, scaly, red and itchy, and there may be extremely inflamed skin and bleeding in more severe cases. Constant scratching is a big NO-NO as it can causes the skin to split, bleed and even leaves it open to infection, making your eczema even worse. Eczema might not be contagious most of the time but if the irritated, raw skin of eczema becomes infected, this infecting agent may be contagious. One’s lifestyle can be changed significantly thanks to the condition, e.g. avoid getting in certain sports/going to pool, and cause lost of sleep, uncomfortable, stress – as these becomes part of their daily life. Kpo have used up most of her skincare product prescribe by PD, we decided to “downgrade” her to QV Baby Gentle Wash to save a bit (tried the sample pack and Kpo Kia papa thought the “texture” and effect is similar to Ceradan, but it’s now a norm that we will at least apply thick moisturer for her at least twice a day, after shower, and before sleep time. For me, I have downgrade my Dentiste Toothpaste back to normal Darlie. My lips still dries up easily and I tried to drink more water as much as I remember. I try not to scratch my scalp to worsen the condition but can’t quit this bad habit totally, especially when I feel stressed or tired. I still hope we will be able to find a better remedy to control our eczema condition but for now, we shall just try to keep ourselves in best possible condition depending on the situation.